Curriculum: Developmentally appropriate curriculum helps children to grow cognitively, physically, socially, emotionally and spiritually. Forcey Christian School is fully accredited by the Association of Christian Schools International and the Middle States Association of Colleges and Schools. 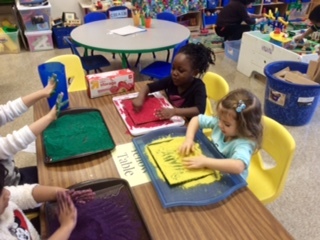 The preschool program is connected with grades kindergarten through eight on the same campus for smooth transition. The excellent program features positive, loving, certified teachers and staff to develop the God-given talents of each child. Differentiated, center-based learning is used with the diverse student population. The Developmentally Appropriate Curriculum features rich language experiences, exploratory math and science activities along with social studies, art and music. Many special events make the curriculum come alive and give parents opportunities to participate – a trip to the farm, teddy bear picnic, color days, Grandparent’s Day, bug day, 100th day, Dr. Seuss Day, school garden and hatching baby chicks. Children will experience purposeful play, hands-on small group activities, large group circle time and outdoor play.